Written by John Ardoin; narrated by Franco Zeffirelli. B&W/Color (1978) 88m. 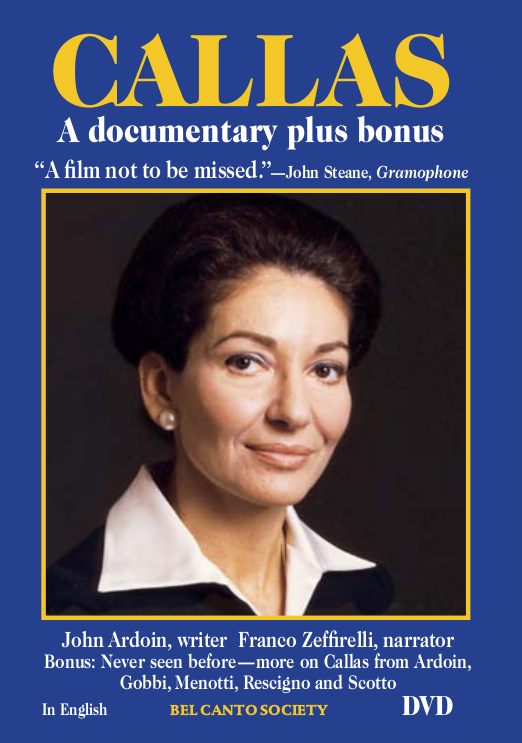 Bonus: never seen before—more on Callas from Ardoin, Gobbi, Menotti, Rescigno and Scotto. Color (1978) 29m. Both programs are in English. Synopsis enclosed. Performance footage: from London, 1964, ‘O mio babbino caro’ (complete) plus her comments to the audience (her voice is not fresh, the middle is in woeful shape, but she puts the aria across), from Paris, 1964, ‘Ah! non credea mirarti’ (complete); from Paris, 1958, ‘Fine al rito…. Ah! bello a me,’ from Norma (you can see her body feeling the musical pulse), ‘Vissi d’arte,’ ‘D’amor sull’ali rosee’ and ‘Miserere’; from Paris, 1965, the recitative to ‘Casta diva’ (she sings with fabulous variety of expression and is commanding yet serene); from Chicago, 1955, Butterfly (1 min., 40 secs., silent); from Milan, 1960, Poliuto excerpt (silent) and 1961, Medea excerpt (silent). Newsreel footage: her funeral cortege; the Rome Walkout (‘I would spit in the faces of my enemies…and make them go on their knees in front of me! I can! I will! And I must!’); her break with Ghiringhelli, Callas reading Bing’s telegram firing her (‘I cannot do routine’); Meneghini, Onassis and Churchill; Callas hounded by the press on her private life; Callas dancing with Onassis; her return to New York (1965); press conference about the Medea film (plus clips from the film); Callas as co-stage director with Di Stefano, directing Vespri in Turin; in a bathing suit with Onassis; interviews with her fans, who had been on the Met standing-room line for four days; Onassis’s death. Interviews: Bing (‘Does she run the Met or do I?…She became intolerable!’…’She was more difficult than others because she was more intelligent”); Nicola Rescigno (‘Her body was like that of a pachyderm’); Rescigno and Giulini explain her actions and their consequences; Lord Harewood’s interviews with Callas; Menotti; Scotto (‘Callas taught me discipline’ and on the Edinburgh Sonnambula and the Scala Medea—’Cut Glauce’s aria’); Caballé; Gobbi on her lost confidence and unhappiness; De Hidalgo on Callas as a student; manager Gorlinsky on the Callas-Di Stefano concert tour; Tebaldi on their rivalry; Visconti in discussion with Callas in French with English subtitles, including the ‘radish’ incident. Other topics: Sound vs. the use of sound: Tebaldi vs. Callas; her debut at 15; her Italian debut; ‘I learned from Serafin that you must serve music’; ‘No agent would give me a job because immediately after my debut I wasn’t loved that much. I was something new to listen to and they disliked anything that took them away from tradition’; her history at La Scala; her weight loss; her glaucoma; Jackie Onassis; Zeffirelli and Gobbi on the London Toscas, her loneliness, her death.